Morgan Stanley's Laura Lembke predicts global EV sales will rise to about 15% of the total market by 2020. MUNICH -- The rise of car-sharing will boost sales of electric vehicles by making them more cost-effective, a banker for Morgan Stanley said. 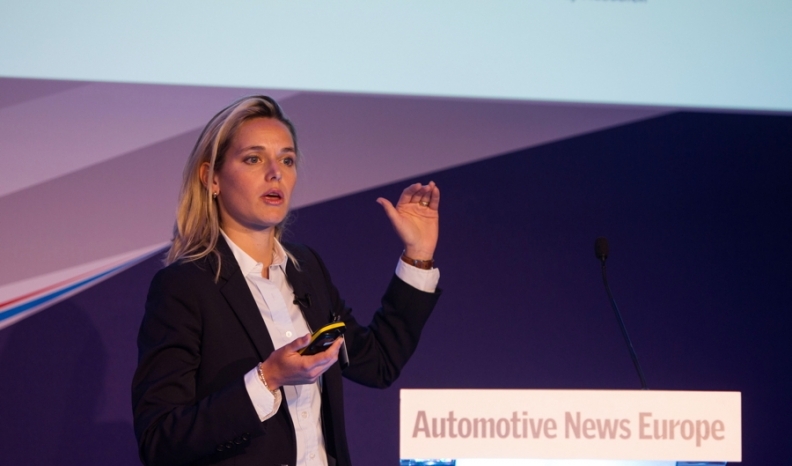 An electric vehicle is better suited to car-sharing,” Laura Lembke, a vice president at Morgan Stanley’s automotive investment banking team, told the Automotive News Congress here on Wednesday. She estimates that car sharing could help reduce the payback on the price premium charged for a more expensive electric powertrain to two to three years, thereby making EVs in a car-sharing fleet less costly to run than cars with a conventional combustion engine. By comparison, it takes many times longer for a private buyer to get the same benefit. This is because the vehicles in car-sharing fleets have the potential to be utilized as a rate of about 50 percent a day compared with 4 percent, or less than an hour a day, for most privately owned vehicles, Morgan Stanley estimates. “Car-sharing and [EV] technology adoption go hand in hand,” she said. Morgan Stanley predicts that EV sales will rise to about 15 percent of the total market by 2020 from well below 10 percent now. BMW sales boss Ian Robertson told the Congress on Wednesday that the automaker’s car-sharing operation, DriveNow, had reached 20 percent utilization of the fleet, up from 5 percent when it first started. He also said the car-sharing program is profitable. DriveNow uses the electric BMW i3 electric car as well as fuel-powered variants of models such as the 1 series and Mini. The potential for growth in electric cars is a major reason why the stock market values Tesla as high as it does, despite the carmaker’s financial losses, Lembke said. Tesla’s popularity with investors compared with a brand such as BMW, which also makes electric cars, can be partially explained by the fact that Tesla doesn’t have a “legacy” business producing conventional cars that can be cannibalized by EV growth. She said, however, that she personally believes Tesla’s market capitalization of $32 billion was “very generous” and that she thinks BMW’s i subbrand, which includes the i8 plug-in hybrid supercar, is undervalued. BMW sold about 30,000 electric cars last year compared with 51,000 for Tesla, according to Morgan Stanley figures. Based on those EV sales, Tesla was valued four times higher than BMW's EV business, Lembke estimated.